Also a master of dance fighting. With an axe. Among the earliest complaints I agreed with on Space Marine was the lack of content. THQ however, worked quickly to fix this, coming out with a new coop mode only a couple of months after the release. When it came out, I was frustrated because a bug wouldn’t let me play, but THQ worked fast to fix that. Now I enjoy Exterminatus whenever I need something new. But depending on who you ask, their timing was anywhere from good to poor. You see, in Exterminatus you can only earn experience. You cannot earn perks or armor. So for those players who already earned level 41, their incentive to play Exterminatus is effectively nil. But for those who have not yet earned the highest tier, it’s a fun change of pace. Hopefully, since THQ is coming out with another version of Exterminatus called “Chaos Unleashed” for the Chaos faction, they’ll add some new armor or perks to earn. In CU, Chaos Marine teams will fight not only Orks but Imperial Guard too, with new boss and units like the Sanctioned Psyker. The DLC comes with new maps and a new game mode. Check it out here. One of the things that shakes up coop against competitive is the fact that in competitive, the best perks tend to focus more on anything that boosts offense and defense enough in the face of short, brutally intense fights against other players. So perks like Serrated Combat Blade, or Iron Halo tend to be really useful. But in the coop, the fight is long, ongoing and full of attrition. The Orks are weak, but keep coming after you with their hordes. They grind you down, wear you out and eventually overwhelm you. So perks that focus more on recovering and sustainability tend to be more useful. Final Vengeance for example is a wasted perk, since your team only gets a very finite number of lives and you do more damage staying alive than blowing up on the Orks. In competitive play, I wouldn’t have bothered with Ammunition Stores because I can recover ammo by killing or respawning. I just never really ran out. But in coop, Tactical and other Devastators need ammo too, so we tend to compete for the ammo drops the Orks rarely leave behind. Typically, you want to avoid any perk that is more about respawning. Rapid Deployment and Teleport Homer aren’t terribly useful because you and your allies should work very hard to avoid death. You maybe tempted towards Master-Crafted Wargear and Favor of the Armory because grenades do well with managing Ork groups, but the occasional difficulty in replenishing grenades will quickly take away from the benefits of these perks. Larraman’s Blessing – You will sometimes have to run away from the hordes to keep yourself from getting overwhelmed. But this perks lets you recover more rapidly and get back into the fight. Weapon Versatility – The beauty of this perk is that you take two guns and not just one with you. By doing so, you also increase the amount of ammunition you take with you as well as the amount of ammo you recover when you get an ammo drop. You can also better react to the kinds of Orks you’ll be facing. Additional Melta Fuel – This perk as well as any that let you take additional ammo is recommended. Given the slow recharge time of a Melta however, you may also consider the Improved Melta Charge perk with this. 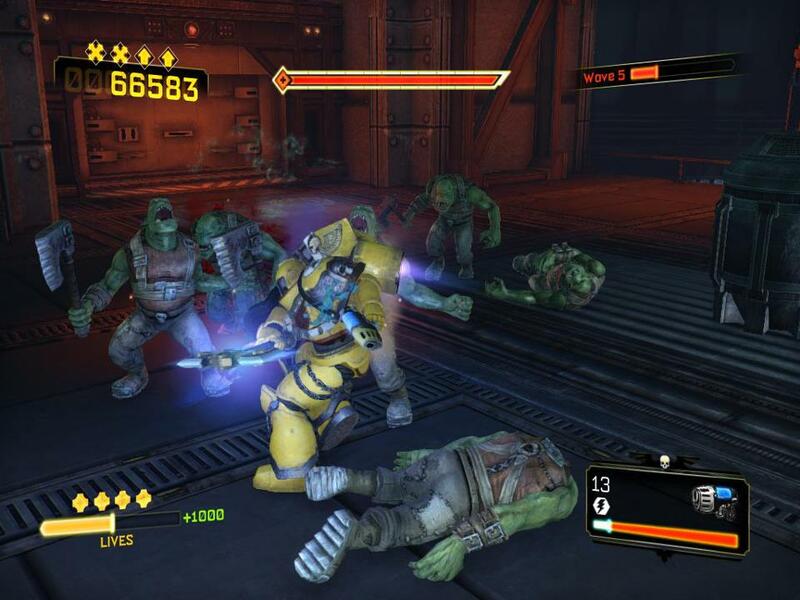 The Devastator’s defensive perks work well in Exterminatus. So it really boils down to the weapon choices. As such, I cannot recommend the Lascannon because of the sheer number of targets and their preference towards close combat. The Plasma Cannon is decent, but one must be mindful of the fact that the Orks are desperately trying to get close, making it personally dangerous. This means that the Heavy Bolter is probably the most reliable choice for Exterminatus. Surprisingly, while Heavy Bolter Expertise is a make-or-break perk in competitive, it’s not that big a deal in coop. Heavy Bolter Coolant – Given the sheer number of Orks, overheating is a huge problem for the Heavy Bolter. This perk goes far to counter it, letting you keep up the barrage of firepower to take them down. Ammunition Stores – When you have one other Devastator or Tactical Marine on the team, getting ammo usually isn’t too bad. But if you have three or more, it becomes very difficult. But Ammunition Stores lets you keep going where as others are down to pistols. Artificer Armor – In truth, almost any of the defensive perks are great for survivability. Artificer Armor however lets you recover from battle damage much more quickly. Just disengage and run until it replenishes your armor. Assault Marines don’t suffer from the necessity of ammunition quite like the other two classes. This is not to say that the pistols aren’t useful, but they should be at the front fighting the hordes face to face. They also have the joy of health replenishing perks, which let them continue to fight where as others have to back off in order to survive. The one change up is that Assault Marines should not be afraid to leap away if they’re getting overwhelmed. Orks prefer numbers and melee combat and sometimes, and that’s too much for a lone Assault Marine to deal with. The jump pack should be used defensively as well as offensively. Perhaps the worst thing about Assault Marines is when they have to take a control point, as they cannot use their best features as offensively as they are intended too. Swordsman’s Zeal – This perk lets you keep going even when your armor is gone. It’s easy to have too much faith in this perk, however, and believe you can stand up to a horde. Fight as hard as you can, then jump away and kill a lone Ork to replenish your life rapidly. Then rejoin the fray. The same applies to the Axeman’s Zeal. Air-Cooled Thrusters – Leaping away from a horde can sometimes spell the difference between life and death. The jump pack stores up to two jumps, so exhausting your supply when you land is risky business. Blast Off and Death From Above pair well with this, so long as you jump as often as you can. True Grit – I’ve seen Assault Marines use this in Exterminatus and it is surprisingly effective. It gives them a very valid ranged option when the Assault Marine must pull away from a horde (the pistol isn’t bad, but a bolter is still better). When the Assault Marine has to take a control point, it also gives him a better weapon for fending off Shoota Nobz and Rokkit Boyz. The only downside is that it makes the Assault Marine more ammo dependent, to the detriment of any Devastators or Tactical Marines. This entry was posted in Naw~naw~news, Reviews and tagged Chaos, Chaos Marines, Chaos Unleashed, Exterminatus, game review, Orks, Space Marine, THQ. Bookmark the permalink.